So what is my point of this rainbow rant or ramble? Hmmm I am not sure. It just bothers me that Sally K. Ride felt the need to be “private” and stay in the closet. America looked up to her as a hero and she couldn’t even introduce the love of her life to the world. I’m guessing if she had had a husband of 27 years she might not have felt the need to be so private. By the way, her partner of 27 years will not be receiving the survivor benefits to which she is entitled. You can thank Defense of Marriage Act (DOMA). Nobody really knows why Sally stayed in the closet or kept her life “private”. Maybe it was fear. Maybe she wouldn’t have been the first woman in space if she had been out, look what happened to Ellen the first few years after she came out publicly. As a lesbian myself, I totally understand their feelings. I always prefer for people to get to know me a little before they know I am a lesbian. Otherwise they usually don’t hear anything I say for the first 20 minutes while they process the broken stereotype in their head that I don’t look like a lesbian (at least, that is the most common response I hear). 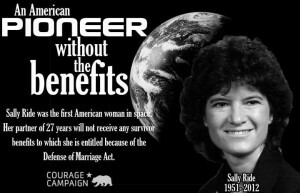 Sally K. Ride probably wanted to be known as an astronaut, be a role model for women and girls and not just be known for being a lesbian. Imagine if she had come out. The headlines would have read “Lesbian goes to Space”. Every interview she did would have had questions about her sexuality. It would have just been annoying. I understand Sally and Anderson. I admire Ellen! Did you know Ellen did not get work for years and Laura Dern did not get another job for a year and half just because she was on Ellen’s Coming Out show? Ellen’s coming out interview with Oprah in 1997. 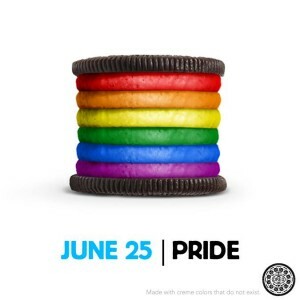 *disclaimer: I LOVE OREOS! However, I do my best to keep them out of my house because if there is a package here I will most likely eat the whole thing. You have so completely hit the nail on the head Sally. It’s one thing to bring up LGBT when it comes to equality and rights…it’s another to make it an identity statement of who we are.. Man Woman Gay Straight Red Purple these labels just creates more separation of humanity. We are all…human. Exactly right. I think the world is overly fascinated by what goes on in the bedroom when that level of interest could be directed towards needed things like, I don’t know, ending disease, poverty, war or healing the environment? This ChicFilA thing has really gotten to me too, espousing hate and bigotry publicly and their supporters are very political. It saddens me this is all still an issue. I have a gay family member who is afraid to come out to the full family because my cousins are very pro-right religious fanatics. I disagreed with her but then found out her instincts were dead on when those same cousins FB pages are full of ChicFilA support messages. I’m not going to interact with them anymore and it’s sad because I only have 2 cousins and now I don’t respect them because they hold this stance so vigorously. This world saddens me. Thank you for speaking out and for so concisely stating the issue. Hugs!! I LOVE this post and you HAVE to post it on ABOW!!! It was EXACTLY what I told Sean when I first saw the news on Anderson Cooper coming out. WHO CARES? WHY does society NEED to “out” people? I look forward to the day when someone’s sexuality no longer makes the news! PS- What’s a lesbian supposed to look like? Can’t imagine the BS you put up with! I wanna just say “what’s the fuss all about anyway?” but then the bible thumpers and all the other uptights feel invited to answer the rhetorical question. Ellen’s awesome.. I love Laura Dern.. I had a major crush on her for a long time.. 😛 I get Anderson Cooper and Sally Ride choosing privacy over publicity. I just wish they didn’t feel they had to do so..